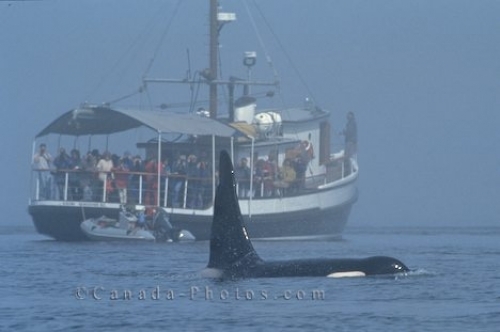 A Killer Whale gives tourists on a whale watching boat a close up view of himself as he leisurely swims by in the lifting fog. This whale watching vessel is one of many that tour the waters off Northern Vancouver Island in British Columbia, Canada to view these majestic creatures in their natural environment. Killerwhale in Johnstone Strait, British Columbia, Canada, North America observed by many whale watchers on the Gikumi. Picture of a whale watching vessel and a lone killer whale off Northern Vancouver Island in British Columbia.